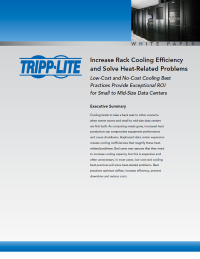 Download this report for insight on how your organization can identify potential or existing inefficiencies and implement data center cooling best practices. IT equipment is often equipped to withstand hot or cool temperature changes, however, running at these elevated temperatures will shorten the equipment’s lifespan. As computing needs grow, so does malfunctions, shutdowns, premature equipment failures and other heat-related issues.